This October MOCA London (Museum of Contemporary Art London) presents European Pa55port, the first London based iteration of the relational work from European artist David Blackmore. In February 2016, in the run up to the UK’s referendum on membership of the EU, Blackmore wrote to the European Commission requesting a non-nation specific European passport, in return for which he was willing to revoke both his Irish and British citizenships. The request was declined, in writing seven months later ‘because such a passport does not exist’. In response to this reply, Blackmore removed the national emblems from both his Irish and British passports the process of which was recorded and disseminated through a dedicated website www.europeanpa55port.com. The work has evolved into a relational piece in collaboration with members of the public. Following a discussion with participants exploring the meaning of national identity using European identity as a counterpoint. 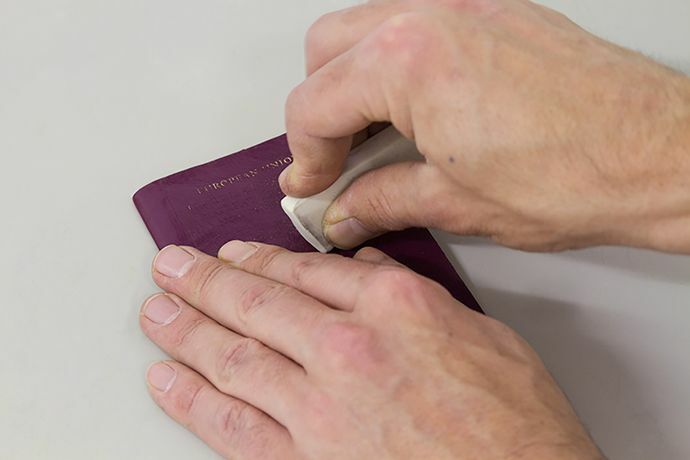 Using erasers willing individuals will rub away the national emblem from the cover of their passport. Born in Dublin (1981) to British and Irish parents Blackmore has been based in London since 2003. Blackmore's initial training was through the medium and criticality of photography. However, over the past decade, his practice has migrated substantially away from photography favouring a Post-Medium practice. Blackmore's works are gestures against authority. Gestures that exploit the gaps, spaces and boundaries that exist between the structures and systems of the Big Other. His practice hinges on the boundary areas between order and dissent; be that between national identity, capitalist society and emotional responses. Taking material from the familiar and disregarded aspects of civil life and the urban terrain Blackmore's works articulate a frustration with the way our lives are dictated to by systems of order. European Pa55port has featured previously at re:publica's Dublin and Berlin conferences on Digital Culture and European society and presented at Rem Koolhaas / Wolfgang Tillmans EuroLab conference in June 2018. David is currently mid-way through a two year studio residency at Chisenhale Studios and Honorary Research Associate at the Slade School of Fine Art researching Protest. A recent work by Blackmore was accessioned to the British Museum's collection and features as part of I-Object: 100 objects of dissent which runs until January 2019.